Announcement Welcome to Orange Fuzz! Happy Shopping and as always feel free to convo us with questions and custom or wholesale requests. Allergy questions? Convo us! Some products contain tree nuts and gluten ingredients. Smells great and keeps me clean. Fast shipping. Thanks! Quality product with fast shipping. Thanks! I have sensitive and acne-prone skin yet this mask/scrub is effective in exfoliating my skin and not stripping it from its natural pH, and gentle enough to use weekly. My skin feels squeaky clean, my pore size has diminished, and the mask smells nice! Also, a little goes a long way so this mask will definitely last me at least 2 months. Definitely recommend! This has quickly became one of my favorite shop! I will continue to buy from this seller. This soap is so pretty and it is well made. Give the ultimate gift to special guy in your life! Last day to save 15% on your entire order! Use coupon code FUZZHOLIDAY in our Etsy shop! Our wedding in 2015, after thirteen years together! Our Etsy shop started in 2009 when we graduated from art school. As artists and makers, we wanted to try our hand at all kinds of mediums. We made a few batches of soap to bring with us to our art shows. The soap proved to be very popular with everyone, so we continued developing our own recipes and unique style. Our shop is run by Amanda and Jessi Poston. We make our bath and body products in our home studio. Some days are dedicated to packaging and preparation for wholesale orders to retailers. And sometimes in the busy holiday season we bring in friends and family to help pack orders so they get out in a timely fashion. Amanda and Jessi have been together since 2002. We live and work in a large two family home in Cincinnati's eclectic Northside neighborhood. We strive to have the unique and innovative products and designs. 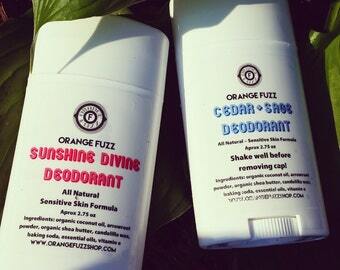 Thanks for shopping at Orange Fuzz Boutique. Orange Fuzz is a collective of professional artists Jessi Lalk and Amanda Poston. We attended Pasadena City College and came to Miami University to finish our degrees. We both obtained B.F.A. 's in studio arts with a concentration in printmaking in May of 2009. Since graduation we moved to Cincinnati Ohio where we live and work in a gorgeous historic building. Our products offer buyers superior craft and excellent design. We do not refund shipping costs. If an item is damaged, please contact us with a photo of damage and we will discuss refund or replacement options with you. Due to the hygenic nature of our products we can not accept returns for refund. Payment for purchases must be received within 10 days of purchase, otherwise sale is subject to cancellation. Items will ship to the address listed on Etsy during payment. Please make sure that your Paypal and Etsy shipping address are correct during checkout as we cannot do anything after the package had shipped. If you would like to have the item shipped to someone else, enter their address into Etsy during checkout. Convo us if you need help prior to ordering. Items will be shipped USPS First Class or Priority within three business days of payment unless otherwise stated in item description. We do not refund shipping costs if an item is damaged or returned. We re-use shipping materials whenever possible to reduce impact on the environment! We also strive to use recyclable materials when packing and packaging our products, don't forget to recycle them! We reserve the right to refuse sale of items at our discretion.